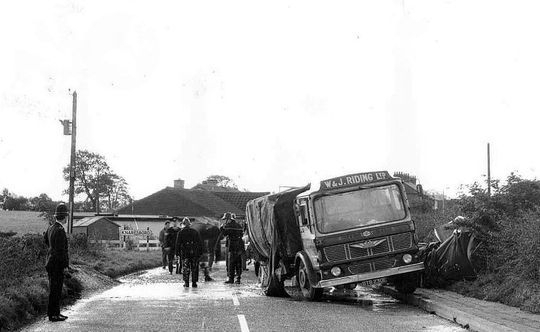 Below is a selection of various incidents which Tom Riding documented from the mid 1950's through to when he retired from the company in 1995. Driver Bert Slater, who was later to spend his whole career at Riding's, was heading north on the old A74 at Ecclefechan in 1947 when he veered off the road and ran into the side of a cottage. 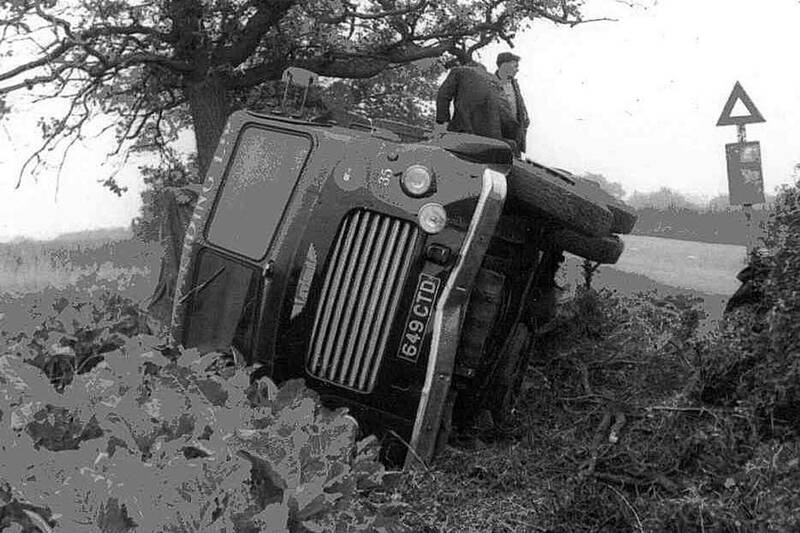 Loaded with ships machinery, destined for Glasgow, Bert was lucky to escape unhurt but the same could not be said of the Leyland Cub four wheeler Reg No 9790 which was written off and scrapped. The badly damaged Leyland Cub, Reg No 9790, with the cab all but destroyed by the impact is pictured here after being recovered and brought back to Longridge. 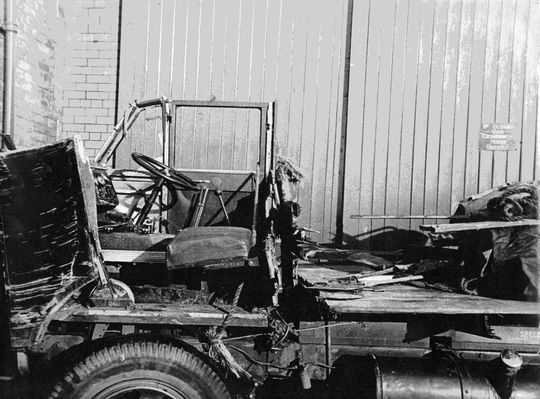 A close up shot showing the remains of the Leyland Cub cab in which driver Bert Slater was lucky to escape serious injury. After being recovered and returned to Longridge it was scrapped and broken up with any salvageable parts for used spares. The damaged ships machinery is seen here after being transshipped from the Leyland Cub on to the back of Leyland Hippo Reg No RTJ 258. The whole load had to be sent back to the manufactures to be inspected for any damage before Riding's could finally deliver it. 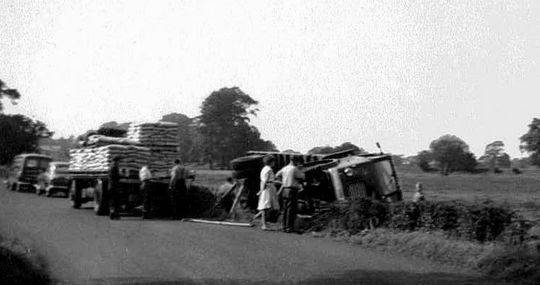 While negotiating the steep hill on the A628 down towards the village of Silkston in South Yorkshire in 1956 driver Jock Innes lost control of this prewar Leyland TSC 9 Beaver Reg No FLV 646 which was hauling a Crane draw-bar trailer. Fully loaded with conveyor belts destined for National Coal Board pits in this part of Yorkshire he very sadly lost his life with the trailer mate suffering some non life threatening injuries. After being recovered the outfit was examined with a fine tooth comb by the Ministry of Transport but was given a clean bill of health. 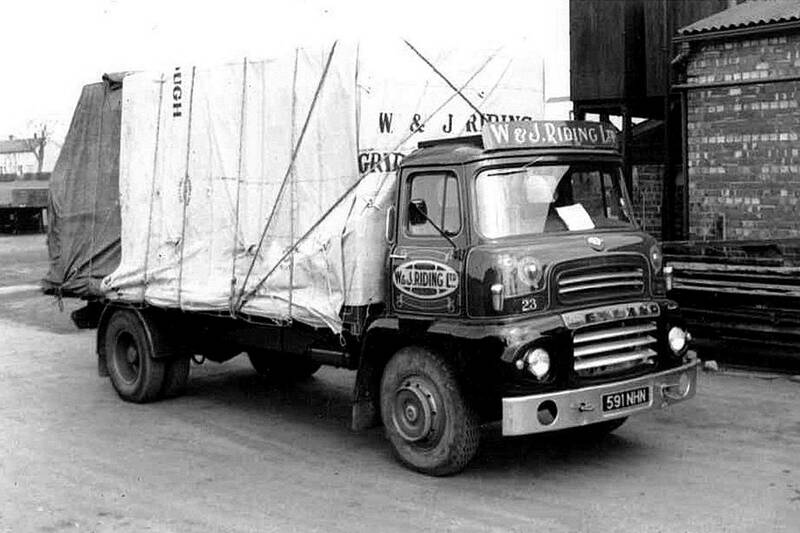 "It's the early 60's and Leyland Beaver 4x2 tractor unit Reg No 649 , driven by Ken Wade, was on nights heading home to Longridge down the A19 from Teesside. Whether it was through lack of concentration or falling asleep Ken ran off the road and finished up with the whole outfit in a ditch on its side. The load was nylon chips in sacks packed in large reinforced steel crates on their way to Australia via Liverpool Docks. 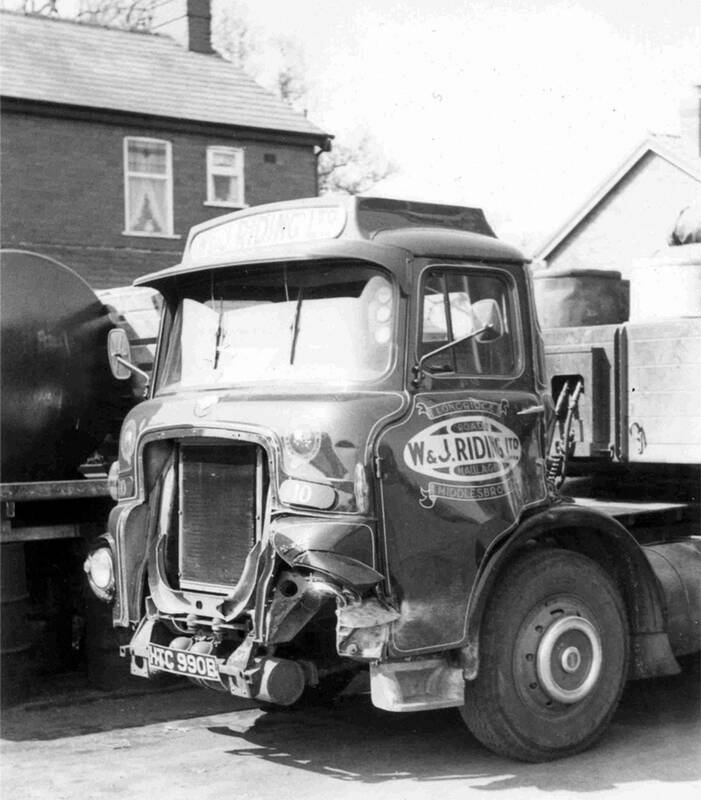 This traffic from ICI Ltd at Wilton was a big movement for us at the time and from memory the load wasn't damaged and the tractor unit and trailer only suffered slight damage with the Leyland Beaver soon back on the road". Leyland Beaver 4x2 tractor unit Reg No 649 CTD lays on it's side in a ditch after coming off the A19. 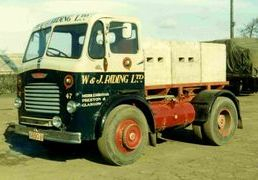 This particular Leyland had two lives while at W & J Riding as originally it was a O.600 engined four wheeler rigid Beaver that was later converted into one of the company's early 4x2 tractor unit's. Leyland Beaver 4x2 tractor unit Reg No 649 CTD along with it's tandem axle trailer lie on their side in a ditch after leaving the road. Amazingly the traffic sign and it's post remained completely intact. 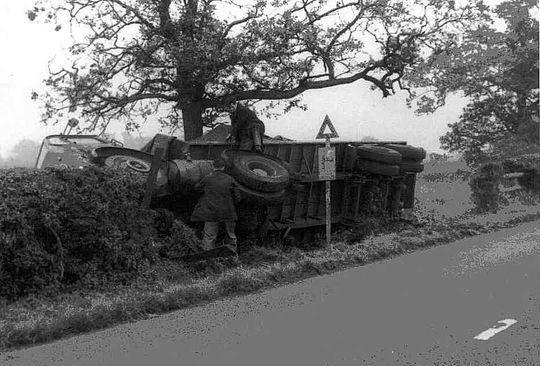 This photograph, taken from another angle, shows how the whole outfit slid on it's side narrowly missing a tree on the right and road sign on the left. 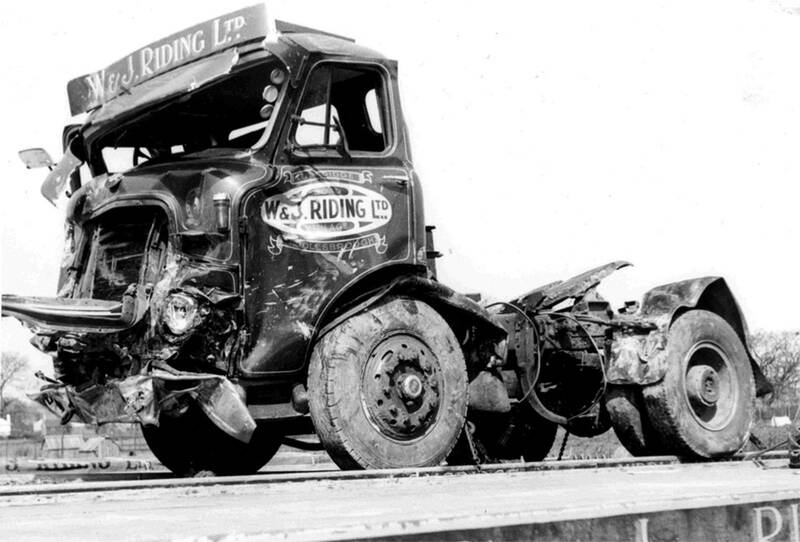 Driver Ken Wade is stood with his back to the camera while Jimmy Sudel is seen stood on the trailer chassis accessing the damage. The underside of stricken Leyland Beaver 4x2 tractor unit Reg No 649 CTD. Fortunately the fuel tank was on the near side and undamaged resulting in no leakage of diesel at the scene. "Leyland at this time only had small 33 gallon tanks available on these short wheelbase Beavers. I discovered that AEC made a short tank that fitted the space available and held 50 gallons so we always fitted these to the 14B10 models and to the later L.A.D. units". "This particular road was a nice short cut between St Michael's on Wyre on the A586 and Bilsbarrow on the A6 but was a notoriously twisty road. The road was later given a 17 ton weight restriction duly closing it to HGVs. 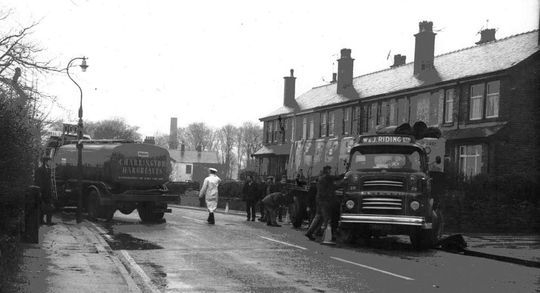 The photograph was taken in the late 50s and i can be seen in the picture overseeing the recovery". 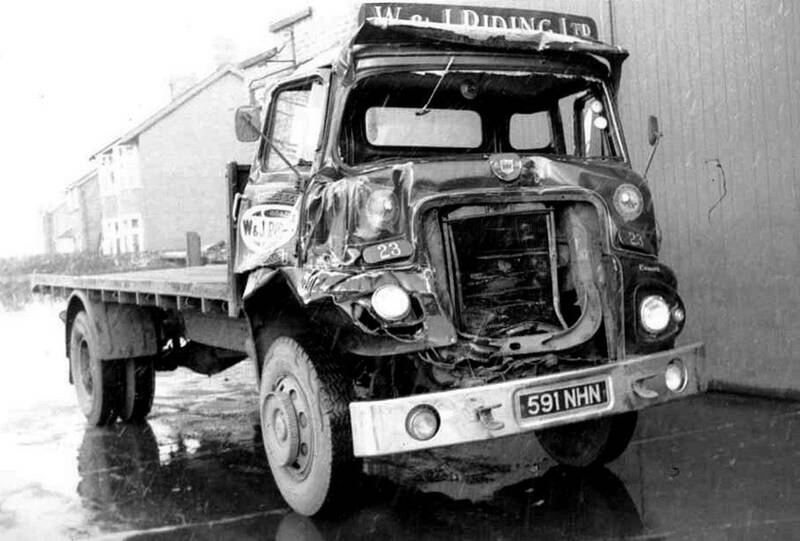 Leyland Beaver 4x2 tractor unit Reg No 680 ETJ came a cropper after sliding on ice and the running into a telegraph pole as it left the depot at Longridge in 1965. 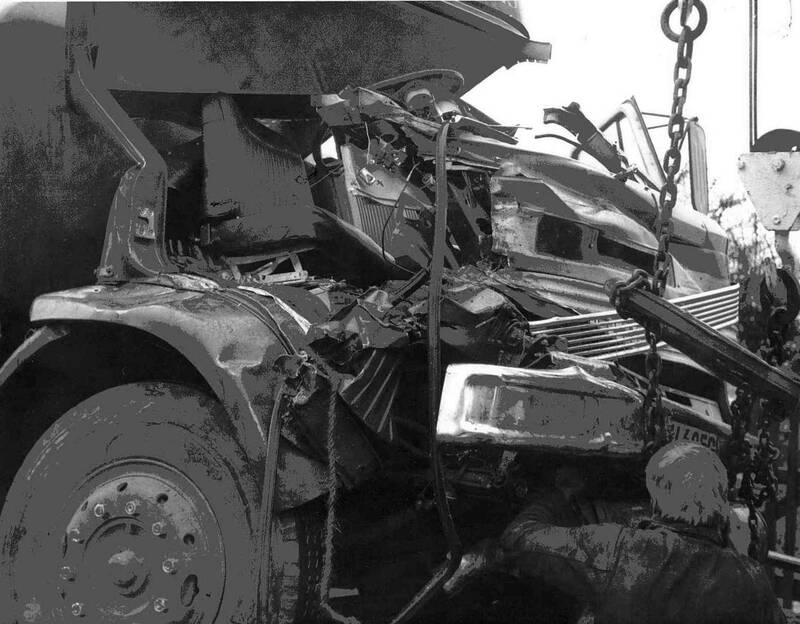 Pictured here in the depot at Longridge after recovery 680 ETJ was only plated at 24 tons gross so unfortunately this accident signified the end of the road for for this tractor unit and it was written off. 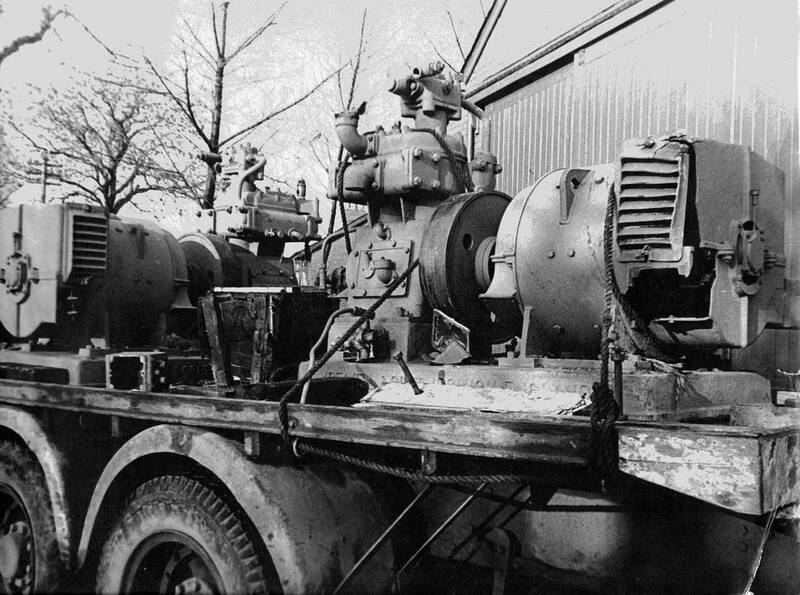 The engine and other salvageable parts would, of course, have been used elsewhere. 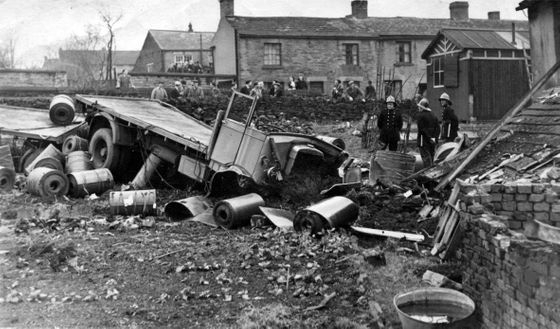 A side view of the damage sustained to Leyland Beaver 4x2 tractor unit Reg No 680 ETJ after it slid on ice and ran into a telegraph pole as it left Longridge in 1965. L.A.D. cabbed Leyland Beaver 4x2 tractor unit Reg No 3800 TD was driven from new by Bill Coolican. On this particular day it was being driven by Ken Wilson one Saturday morning hauling a Crane four in line trailer destined for Preston Docks loaded with Tote bins on the Wilton to Carrickfergus inter factory service. Just North of Whalley on the A59 one of Charrington Hargreaves Ford 'D' Series tankers ran into the side of Leyland Beaver 4x2 tractor unit Reg No 3800 TD. Graphic detail of the damage substained to Charringtons Hargreaves Ford 'D' Series four wheeler tanker after it ran into the side of L.A.D. Leyland Beaver 4x2 tractor unit Reg No 3800 TD just north of Whalley on the A59. Easter 1965 and disaster struck when L.A.D. 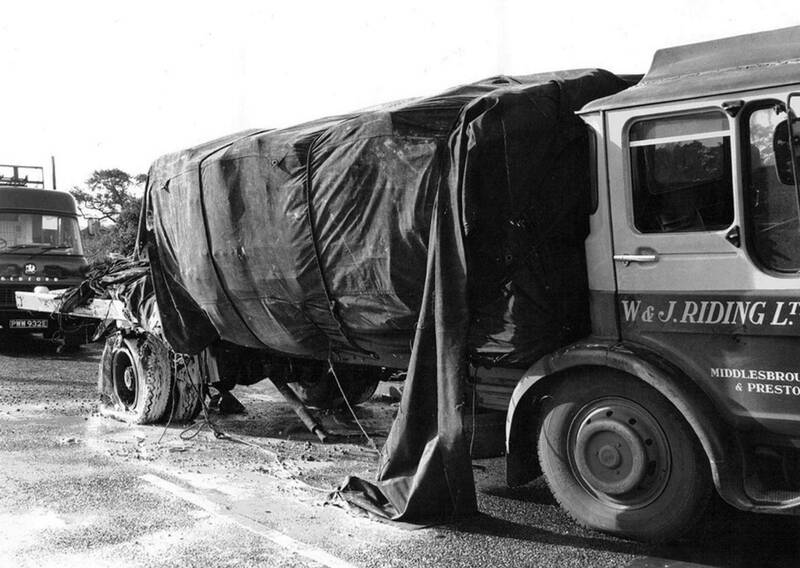 cabbed Leyland Beaver 4x2 tractor unit Reg No ATF 550A while hauling a fully loaded trailer of Terylene spools destined for the ICI plant at Kilroot came to grief at Barrowby Bridge North of Thirsk. It completely demolished the bridge wall spilling it's load into the river below. L.A.D. 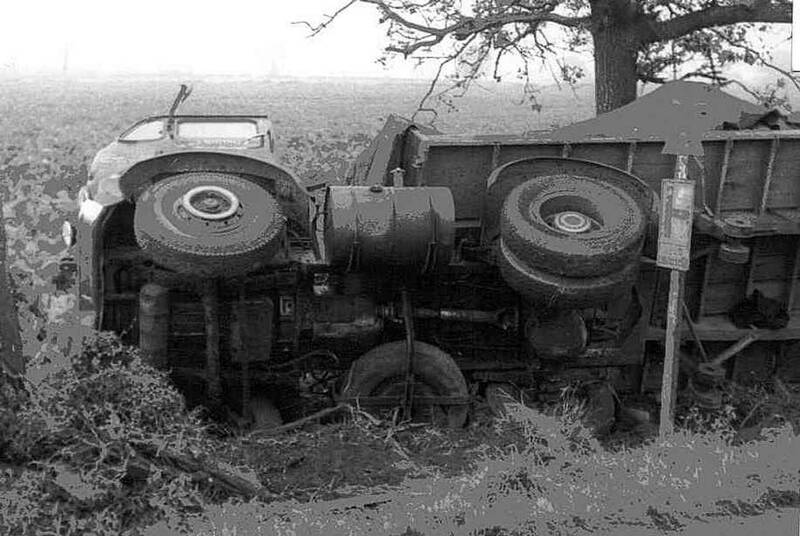 cabbed Leyland Beaver tractor unit Reg No ATF 550A is pictured here after being recovered following the major accident at Borrowby Bridge north of Thirsk. 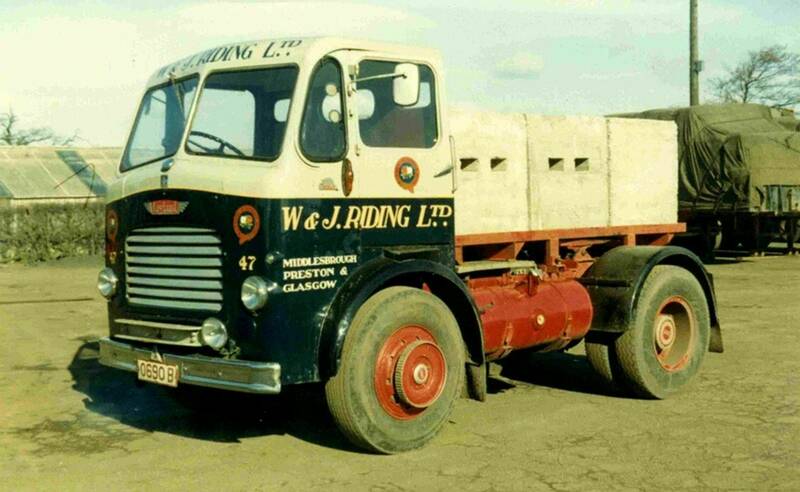 This tractor unit was completely rebuilt in house by Riding's and put back on the road with in a matter of weeks. L.A.D. 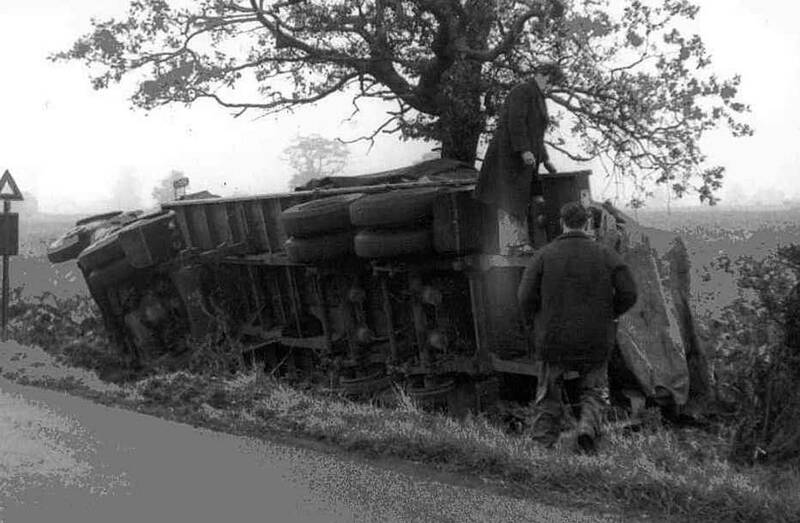 cabbed Leyland Beaver 4x2 tractor unit Reg No HTC 990B came to grief after it slid on ice and crashed into a bridge on the A59 at Blubberhouses in 1965. 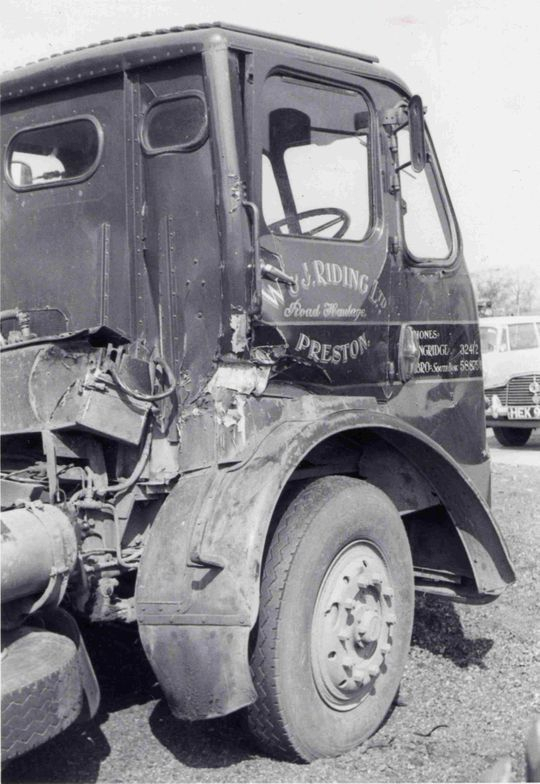 "We had a local job on stock transfer from ICI Hillhouse at Thornton Cleveleys down to Squires Gate Blackpool and believe it or not the tractor unit was used in this damaged state for a week or two until we could bring it into our own workshop to sort it out". 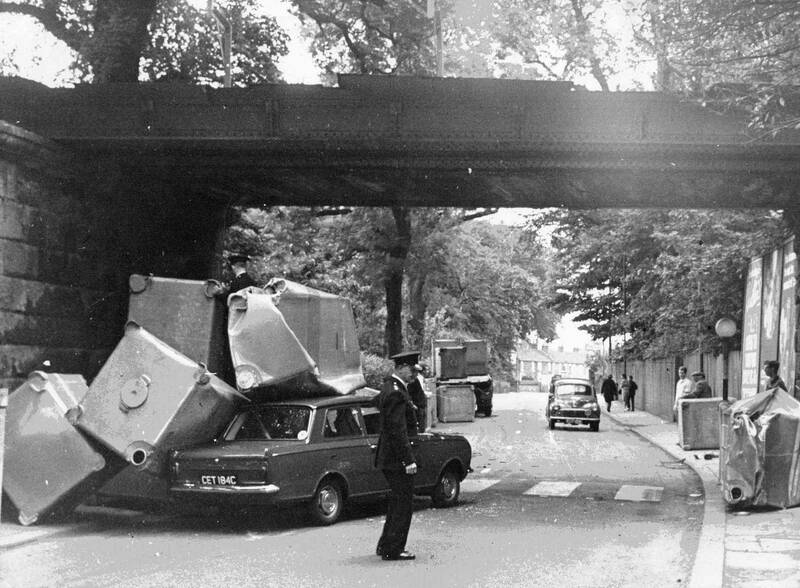 When empty tote bins were being returned to ICI they were always stacked double and W & J Riding's drivers could only use a recognised route. 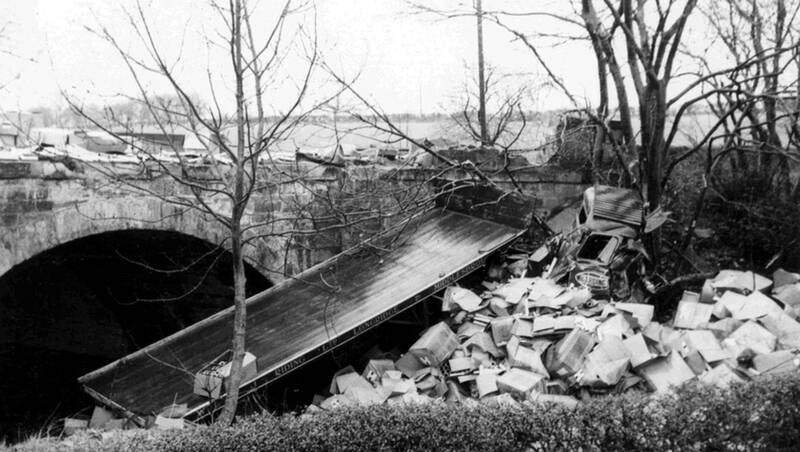 However one Sunday morning driver Frank Collins forgot and tried a variation of his route thus the resulting in striking the low bridge pictured above. Fortunately no one was hurt in the accident although the Vauxhall Viva came off a little worse for wear. L.A.D. cabbed Leyland Comet four wheeler Reg No 591 NHN Fleet No 23 is seen here in Longridge depot after being recovered following an accident on the A59 near West Marten. L.A.D. cabbed Leyland Comet four wheeler Reg No 591 NHN ran into the back of one of Riding's own articulated trailers being pulled by 680 ETJ which was an air braked Leyland 14B10 Beaver. 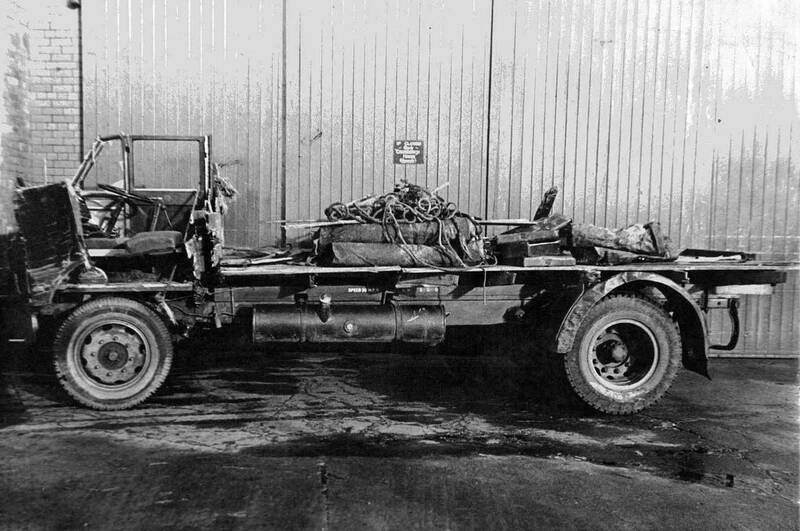 The Comet was fitted with air over hydraulic brakes which were obviously not as powerful as the vehicle in front. The driver, who shall be nameless, carried a bit of weight so he was a lucky lad to get out of it unharmed. 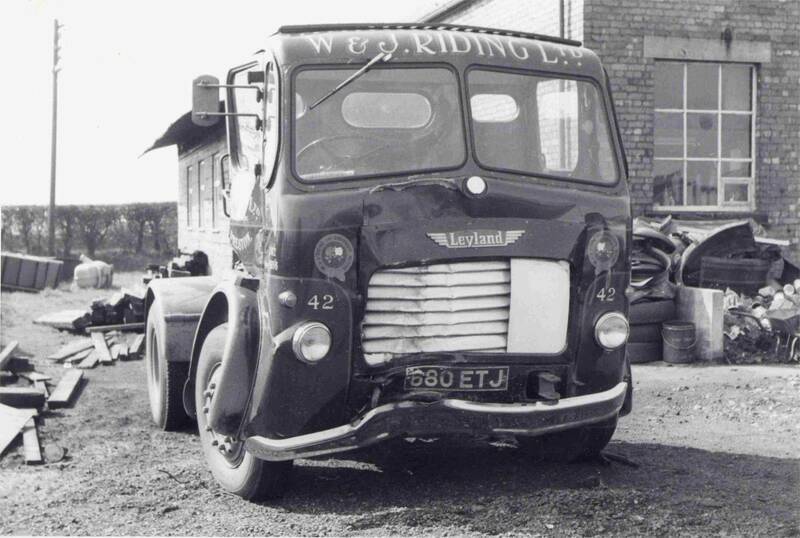 After the accident Leyland Comet four wheeler Reg No 591 NHN was later rebuilt in Riding's own workshops at Longridge. 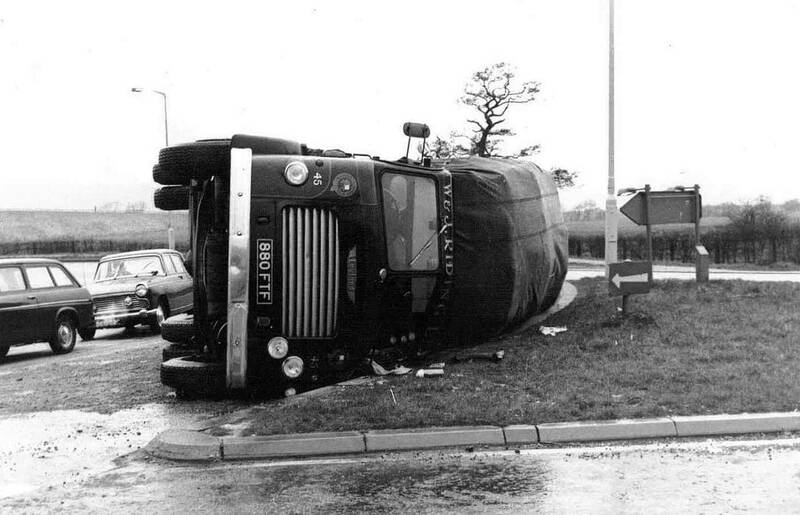 Leyland Beaver 4x2 tractor unit Reg No 880FTF rolled over on the roundabout beneath Junction 31 of the M6 near Preston. After the accident beneath Junction 31 of the M6 near Preston Reg No 880 FTF was repaired and converted into the yard shunter. Albion Clydesdale four wheeler Reg No BTB 230E was involved in an accident while loaded with paint destined for Leyland Paint's North East depot. Albion Clydesdale four wheeler Reg No BTB 230E Fleet No 23 was registered new on the 1st of February 1967 at a cost of £2,662. It is pictured here on the A6055 just North of Knaresborough after being involved in an accident while loaded with paint destined for Leyland Paint's North East depot. BTB 230E was later sold on to a firm in Liverpool on the 22nd of February 1976 for £800 plus vat at 8%. A close up shot of accident damaged Albion Clydesdale four wheeler Reg No BTB 230E Fleet No 23. 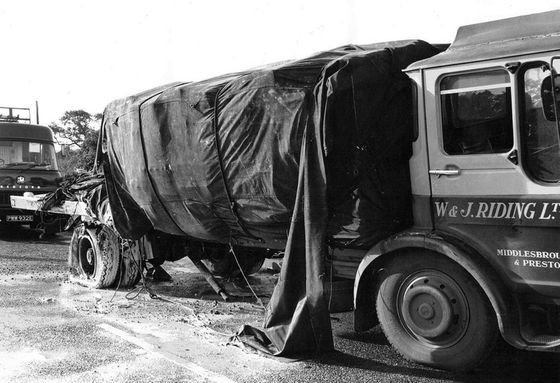 The accident on the A6055 just North of Knaresborough occurred after BTB 230E was involved in a collision while loaded with paint destined for the Leyland Paint depot in the North East. Seddon Atkinson 400 Series 4x2 tractor unit Reg No VHG 570R Fleet No 62 'Mammoth' came to grief beneath the M621 Stourton interchange Leeds on the 26th of April 1983. 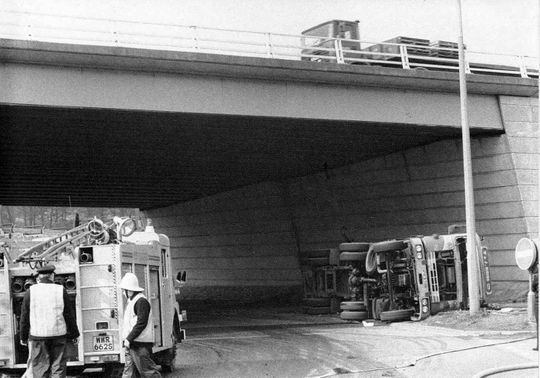 On the 26th of April 1983 Seddon Atkinson 4x2 tractor unit Reg No VHG 570R was negotiating the roundabout beneath the M621 interchange at Stourton Leeds. The vehicle rolled over while hauling a 20ft demount tank loaded with Isopropylamine and stopped just short of hitting a lamp post. Fortunately the fully loaded tank held firm and there was no spillage at what so ever.